Well. I’ve made two wearable muslins for KS2627 for my Make a Garmant a Month plan. So, first I checked the finished garment measurements. (see I am learning) The bust for a size L is exactly my bust measurement so I decided to cut an L through the shoulders tapered out to XL from the bust down in the front only. 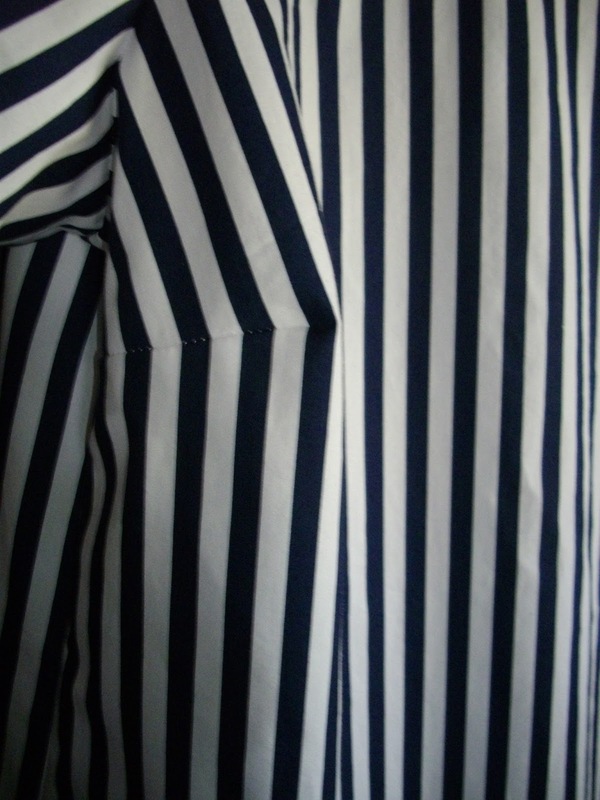 That is the back is a straight L.
And I’ve just spent ages looking for pics of this first wearable muslin and they are nowhere to be found. My laptop did have a catastrophic system failure last week resulting in it going in for repairs. I presume that somewhere in this I ‘lost’ the pics. Oh well…. Anyway the fact is that the first muslin was too big. So then I cut a size L everywhere. And it was still too big. So then I cut (the already cut pieces) to a size M through the shoulders and an L from the bust down. This is how it turned out. And now it also seems that I can’t find all the pics of this top. So I really should leave this and take some more. But of course I’m not going to because this post has been brewing for days already. We’ll just go with what we have. 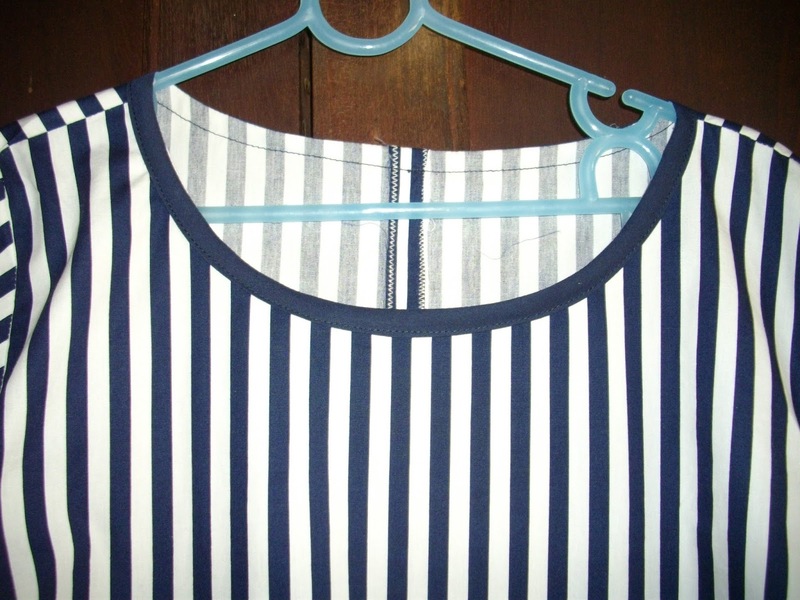 So as you can see I used navy bias binding for the neckline. And on the sleeves. Of course this was after first just machine stitching with white thread. 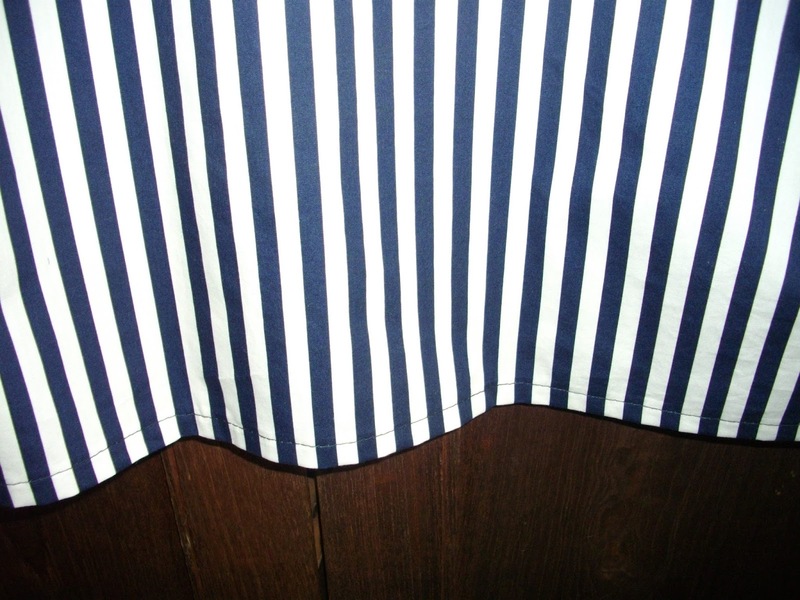 And then doing it again with navy thread. I told you I spent a lot of time faffing about. I also played around with the darts a bit to minimise stripe distortion. 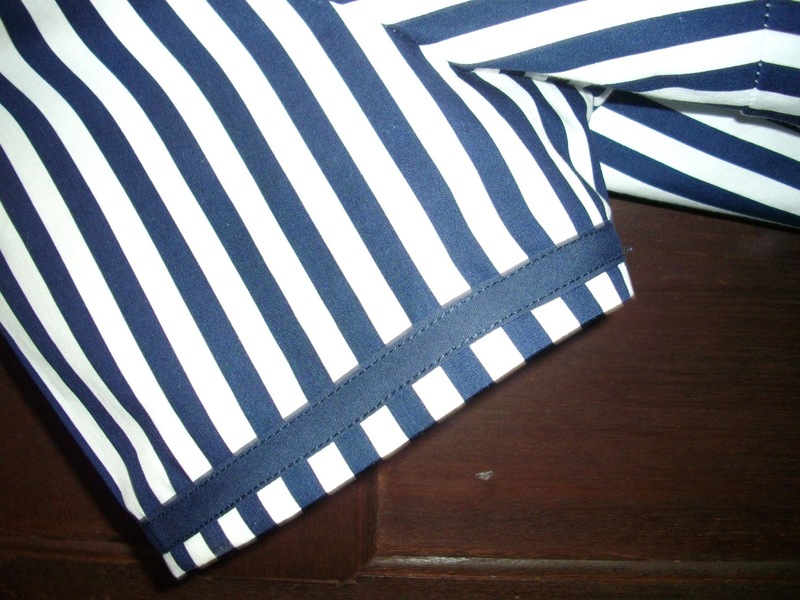 I just machine hemmed it with navy thread. I did think about using bias binding again but decided it would make the hem too stiff and sticky-outy (now there’s a technical term). By the way you can get this pattern here. And it’s free! 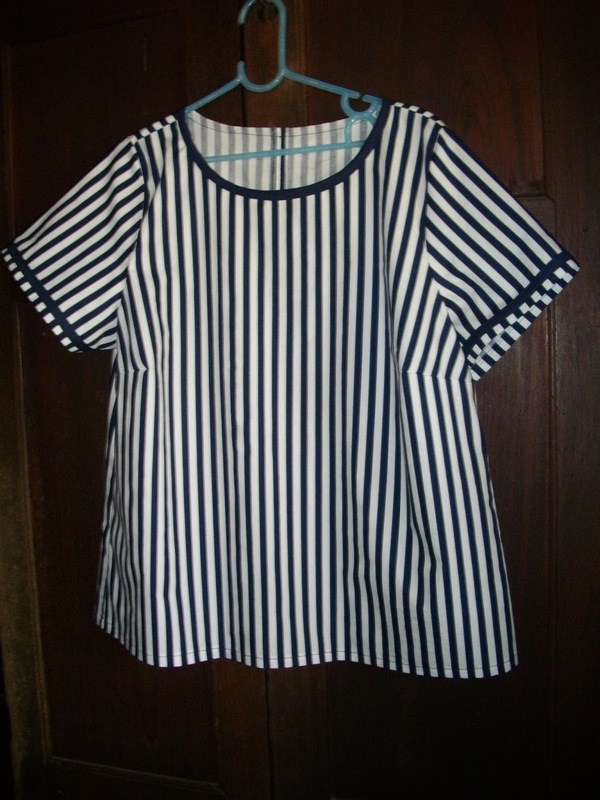 And it’s also navy so it fits with the sewcialist #bluefebruary theme. So do any of you have trouble cutting the right size because you can’t get your head around being that ‘small’ or that ‘big’? Or is it just me? I’d really like to know I’m not alone in this so please leave your thoughts in the comments. EDIT No.2 I knew that I had read something on one of the many sewing blogs I read about exactly this. The lovely onedabbles reminded me that it was Karen. She coined the term Reverse Vanity Sizing and I think that’s perfect! Yes, I think that's where I misjudged my straight-ish skirt – going up a size because I couldn't possibly be a 14 – well, not all of me. Also at http://www.didyoumakethat.wordpress.com in Karen's recent post about the Hollyburn skirt, she mentions Reverse Vanity Sizing – where you cut things a bit bigger. Also, I can at least try and fix things if they're too big. If they're too small, I'm sunk. Yes, that's it exactly “I couldn't possibly be a ….”. And of course you are right that if they're too small we are sunk. But it is still very frustrating. Did you manage to fix the skirt? I did, thank you – just zoomed down the seams again. It's enough to suit me at the moment because I'm only beginning to sew – anything I can wear is a triumph. Yes anything wearable is a triumph! And thanks for the reminder re karen's post – I knew I had read something somewhere but couldn't for the life of me remember where. Good luck and remember just keep stitching. The learning curve is steep so in no time you'll be amazed at what you can make. Nice top! And I always measure the pattern itself, and go buy that number. That's the only measurement that really counts. Thanks Juliane and you are so right – that is the only measurement that really counts!